This was a '92 Marin Bear Valley SE. 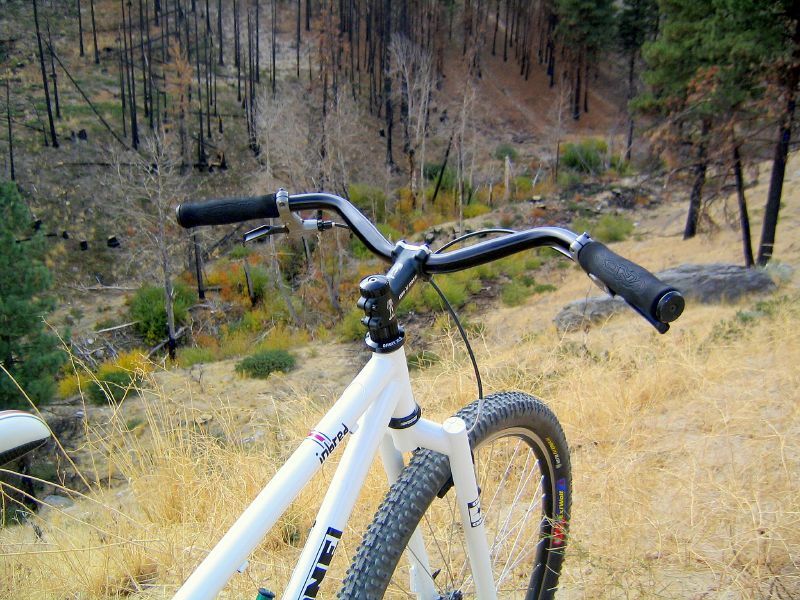 It was my second mountain bike (my first was a Tushingham B-52). This became my wifes, and recently became mine again. As I've already got a road bike, a 'proper' mountain bike (Sunn Revolt) and single speed, I decided this one would be someting more frivolous. So this is my fun-in-the-sun beach cruiser, to be used for riding down to the beach with my kitesurfing kit. Coaster brakes and single speed so I can use hands for holding my kite board. This is a retro-bike and ebay bitsa (bitsa this, bitsa that). Ebay kona handlebars, coaster hub, rims, 2.4" holy roller tyres, 'dale octopus pedals, fsa chain ring, sprocket and chain device. Retrobike P2 forks, BB and cranks. Not too sure on retrobike etiquette, but I hope doing this to a 16 year old bike isn't viewed as sacriledge! Last edited by Jbiker on Sun Jun 29, 2008 5:32 pm, edited 1 time in total. F@*k me they are monster handlebars- Bike does looks super cool but those bars are 'orrible IMHO. But bizarre. WTF are those bars? My wife hates the bars too. I'm reserving judgement, but the upright riding position is nice. You used to be able to pull humungus skids with a coaster brake. That is seriously cool.. and, those crazy P2's actually look good on a bike for once Nice one dude!! loving it all except the bars. Get some Mary bars, that'll suit it better. Oh and is your tensioner set up right - there's still some slack?